• "70mm film like anything has its advantages and disadvantages. It is particularly appropriate for those films that are set in locations of outstanding natural beauty. For example, it was certainly the right film for shooting "Lawrence Of Arabia", where capturing the magnificence of the desert was so important". For more than half a century starting in 1954 Tak was one of the most esteemed design engineers in the motion picture industry. What starts out as a lavish train ride through Europe quickly unfolds into one of the most stylish, suspenseful and thrilling mysteries ever told. From the novel by best-selling author Agatha Christie, “Murder on the Orient Express” tells the tale of thirteen strangers stranded on a train, where everyone’s a suspect. World-renowned detective Hercule Poirot must race against time to solve the puzzle before the murderer strikes again. Kenneth Branagh directs and leads an all-star cast including Penelope Cruz, Willem Dafoe, Judi Dench, Johnny Depp, Michelle Pfeiffer, Daisy Ridley and Josh Gad. “Dunkirk” opens as hundreds of thousands of British and Allied troops are surrounded by enemy forces. Trapped on the beach with their backs to the sea, they face an impossible situation as the enemy closes in. The story unfolds on land, sea and air. RAF Spitfires engage the enemy in the skies above the Channel, trying to protect the defenseless men below. Meanwhile, hundreds of small boats manned by both military and civilians are mounting a desperate rescue effort, risking their lives in a race against time to save even a fraction of their army. A historical listing of the roadshow engagements of “Cheyenne Autumn” held in North America. These presentations utilized 70mm prints derived from 65mm Super Panavision photography projected onto large screens and featured discrete six-track stereophonic sound. The film’s formal public world premiere was held at the Warner in London on October 15th, 1964. The clarity and grandeur of the large-scale images in "Norway-The Film" are due to the fact that the film was shot in 70mm, with the same Panavision camera used for "Lawrence of Arabia." Following some pre-70mm shows, "The Master" is now opening in 70mm across USA. Follow this page for the facts about "The Master" in the coming months. We used a 70mm camera system that’s been around for 50 years and is still the highest quality way of capturing imagery. There’s a big price to pay getting film stock in and out of places and moving that equipment around, it’s harder now than ever. 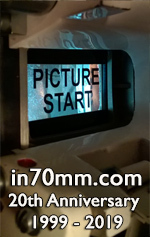 No 70mm prints have been planned - yet. The premiere in Canada will be a state-of-the-art high-end 4K digital presentation, with full uncompressed 6-track digital sound. "Hamlet" is the first British film in 25 years to be filmed in 65mm. The man charged with capturing the look of the film was cinematographer Alex Thomson. "The fabulous advantage of 70mm is the sharpness of detail it gives, which can look three-dimensional at times"
"Far and Away" began as a small film which Ron and I talked about making, while shooting "Backdraft"
The story of the making of "A Year Along the Abandoned Road" contains a lot of technical innovation. It also contains a different film language, and five Norwegians who fought sub-Arctic nature in order to turn a "crazy" idea into a 12-minute, 70mm film. "Tron" was shot 65mm 2,2:1 aspect ratio for all scenes. 65mm color for all the "real world material," and 65mm Black and White for all the material that was later composited into the "electronic world". Twenty-five years ago, “Brainstorm”, was released to movie theatres. Though the film was not a box-office success, it is remembered for its effective large-frame cinematography and sound design. “2001: A Space Odyssey” had its world premiere on 2 April 1968 at the Uptown Theatre in Washington, D.C. The critically acclaimed film had what is believed to have been a record number of 70-millimeter wide gauge prints made for a film during the roadshow era. In '86, Bob Harris, contacted Columbia with a proposal to restore the original premiere version of "Lawrence of Arabia"
the film helped to establish 6-track stereo sound for the 70mm format, yet the original ground breaking 6-track soundtrack has not been heard in the past 30 years. “The 65mm stock is absolutely incredible and it has no rival now,” exclaims the cinematographer. “It is simply the best format we had to work with. The idea of telling a story through scene action and content motivated by grand symphonic sound design with limited dialog. A comedy about a psychiatrist and his patients who express feelings of being possessed. When I started to think about what to show this year I finally decided that "West Side Story" was the one. I had no idea then that it would be so popular. From the beginning notes of Ligeti's Atmospheres to the closing performance of the Blue Danube, their performance made familiar notes come alive and the hairs on the back of your neck stand up. Grand Prix 21.12.1966 Warner, NYC, USA New 70mm print screened 23.05.2006 for Academy staff. Tron 08.07.1982 State 2, NYC, USA Live action filmed in 65mm. Computer graphics photographed in VistaVision. "Hamlet" 25.12.1996 Ziegfeld, NYC, USA Panavision System 65. Technicolor, London manufactured 31 x 4-hour 70mm prints. 5 of which were made from the original 65mm camera negative (Technicolor, February 28, 1997). The Arriflex 65mm camera ARRI 765 was used for short segments. 30 frames per second and 12 track stereo. "New Magic" 1985 Showscan feature filmed with Super Panavision 70 rack over 65mm camera. A Year Along the Abandoned Road 11.06.1991 Grimstad, Norway. Tell us about shooting -- where was it shot? How big was the crew? What made this video special? We shot on 65mm, using this rare camera of which there are only three left in the world. I shouldn't be saying this, but I was carrying it through a rock quarry and dragging it through sand while thinking "this camera literally shot The Dark Knight, this camera shot 2001: A Space Odyssey." It’s from the 70s and looks like a NASA device. It shoots the highest resolution. If you want to shoot a big action sequence you use a 65mm. It helped me get that epicness I thought the song required. What format was the movie shot on? Lubezki: It’s a combination of 35mm, which was used for the scenes between Ben and Olga in Oklahoma, and 65mm for several shots of Ben and Rachel McAdams. That relationship is perceived by Ben’s character as less romantic and more stable and realistic, and we felt that the 65mm expressed that stability and a kind of hyper-reality. Aside from a scene with some buffalo that we shot in 65mm because we couldn’t get too close to the animals, we didn’t use cumbersome equipment. For the buffalo sequence, we used a crane because we wanted the 65mm material to feel a little more steady and different from the rest of the movie, but other than that we used a combination of Steadicam and handheld. And when I say handheld I don’t necessarily mean a moving camera — sometimes we use sandbags and just prop the camera on the floor or another part of our location. Many interior scenes were filmed on set in Louisiana. In addition to shooting the majority of the film on 4-perf 35mm, Schwartzman shot roughly 150,000 feet of 5-perf 65mm film to take advantage of the additional dynamic range and resolution. Large format 5-perf 65mm was strategically employed for master shots and for visual effects. With a native aspect ratio of 2.20:1, 65mm provided Industrial Light & Magic with some additional frame space to maneuver for the film's 2.00:1 aspect. “The 65mm film negative gave ILM an incredibly high-resolution image for effects shots,” he says. Terrence Malick’s "Knight of Cups", which premiered at the Berlin Film Festival in early February 2015, has literally been years in the making. Shot in 2012, on 35mm, 65mm (Panavision 65HR) and a variety of digital formats, "Knight of Cups" has had a two-year post-production cycle. "For the dramatic entry into the Hundred Acre Wood and iconic Pooh Sticks Bridge scenes, the cinematographer selected a Panavision System 65 camera, fitted with a combination of Ultra Panavision lenses and spherical glass."